Some landforms north and west of the Mars volcano Olympus Mons may be evidence of recent plate tectonic activity. Landforms north of Mars' Olympus Mons volcano may be evidence of recent tectonic activity. Left: uninterpreted image, from NASA's Mars Odyssey spacecraft. Right: interpreted image. If the study's conclusions are confirmed, they would overturn conventional wisdom, which holds that plate tectonic forces are unlikely to have played a major role in shaping the surface of Mars — particularly in the recent past. Earth's surface has been shaped over the eons by giant crustal plates that pull apart, smash together and dive under one another. View of a stretch of land west of Olympus Mons, which has landforms that may be evidence of recent tectonic activity (interpreted image). These plates slide around on a layer of partially molten rock called the mantle. Earth's interior is hot enough for mantle rock to remain in a soft, relatively plastic state, partly because our planet is relatively large. The more massive a planet, the hotter it is on the inside. Mars is much smaller than Earth — about half as wide, and only 11 percent as massive. Consequently, many scientists think the Red Planet is too small, and its interior too cold, to host plate tectonic processes. Yin thinks he has found solid evidence that plate tectonics carved out many of the landforms we now see on Mars, and may still be shaping the planet today. If true, Mars would be a better candidate for extraterrestrial life than scientists have thought. Plate tectonics could help replenish nutrients needed to foster life, for example, bringing carbon and other substances from the Martian interior up to the surface. show many regions to the north and west of Olympus Mons that Yin said had not been examined in detail before. Many of the images show scarps, folds and terraces — which on Earth are classic signs of tectonic activity, Yin said. So Yin favors the thrusting of crustal plates over alternative explanations — such as landslides — that have been offered by other scientists. Some of the photos depict deflected, meandering drainage features, which provide further evidence of plate tectonics, Yin said. A view of Mars' three large Tharsis Montes volcanoes, which lie in a straight line. Olympus Mons, the largest known volcano in the solar system, is at upper left. "No drainage likes to flow the long way," Yin told SPACE.com. "It's a classic expression of active tectonics." Yin thinks Martian plates were moving and grinding perhaps within the last 250,000 years, and even may be at it today. "It really depends on the erosion rate," Yin said. "But all of these features, if you see them on Earth, you say they're active." Yin acknowledges that his views lie outside the mainstream scientific view. He may bring a different perspective to Martian geology than most scientists because he has spent most of his career studying landforms and processes on Earth. "I'm way out there," he said. "I'm new to this field, but I've been working on Earth geology for 30 years." 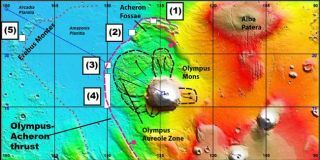 The landforms on Olympus Mons' northwest flank are not the only argument for tectonic activity on Mars. Other researchers have pointed out that the Red Planet has several long, relatively straight chains of volcanoes — including three volcanoes that make up the Tharsis Montes, near Olympus Mons. These features are tough to explain, but plate tectonics can do the job, Yin said. The volcano chains could have formed from the motion of a crustal plate sitting over a "hot spot" in the mantle, just as the Hawaiian Islands are thought to have formed on Earth. Another piece of evidence, Yin said, is Mars' Valles Marineris, the biggest known canyon complex in the solar system. At 2,800 miles (4,506 km) long and 7 miles (11.2 km) deep, Valles Marineris dwarfs Earth's Grand Canyon. Other researchers have argued that the canyon system is likely a tectonic feature, and Yin agrees with that assessment. A few years ago, NASA's Mars Global Surveyor spacecraft detected striped patterns of magnetic fields on the Martian surface. One possible explanation is ancient tectonic activity: As molten rock rose from the Martian mantle to the surface, it cooled and was magnetized in the direction of the planet's shifting magnetic field. Later on, this new surface was split apart by more rising material, which took on a different magnetic orientation, creating the various bands. These striped patterns have been found on Earth, where they have been interpreted as signs of a strong magnetic field and plate tectonics. While none of this proves Mars has active plate tectonics — or ever did — Yin thinks all of the evidence, taken together, is compelling. "People inside the Mars community are pretty resistant," Yin said. "But a lot of other people are very excited about these findings."